Lauren Fontenot is a Texas-born photographer who is currently creating a beautiful life with her husband, twins-on-the-way, and golden retriever in Southwest Louisiana. When she's not shooting weddings, Lauren loves spending time watching Bravo and HGTV, where she finds inspiration for decorating her adorable white farmhouse. We're usually quite the sticklers when it comes to consistency, which is why we usually select a single session to feature throughout each of our branding collections. If you grab a copy of any promotional material sent through your favorite retail store, you'll notice that they generally showcase one or two models in a single location to limit the number of variables. The idea is to get your eyes on their clothing or accessories (once you've seen the same faces once or twice, you have a natural tendency to shift your focus to the items that change within each frame, like the model's clothes, jewelry, etc. Lauren is the exception to this rule. She has somehow found a way to incorporate weddings, family sessions, newborns, & detail shots all while staying true to her unique style as a photographer. It's difficult to find a group of photos that work well together when the colors, lighting, and camera settings are all different, but this girl makes it look easy! We love what you did with our Aspen website template, Lauren! Thanks for letting us show off your beautiful work! "I have been meaning to reach out via Instagram just to say how much I LOVED using the template that I purchased!! I am in the middle of my busy season and knew I needed to update my website for this upcoming season of brides/clients who would be viewing it! I was so overwhelmed because honestly I felt like I didn't have the time or the knowledge to make my website what I had envisioned, and when I found Bittersweet Design Boutique and the template that I purchased I was so happy! It was such and easy and smooth process that I only had to set aside one day to be able to complete!!" 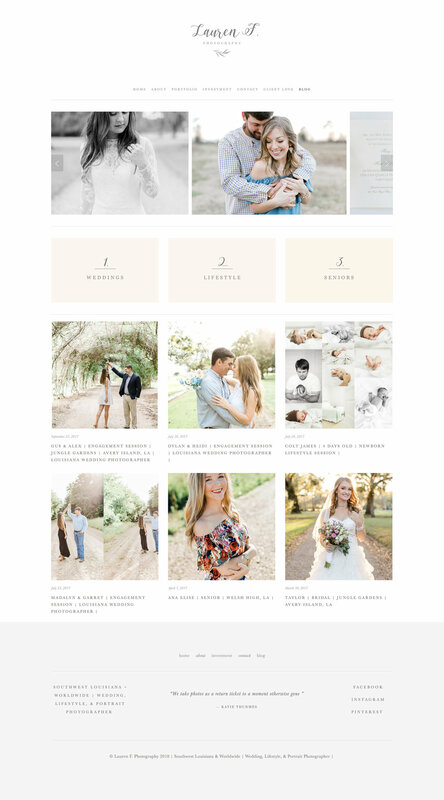 We've been getting a lot of questions about our photographer website templates for Squarespace, so we wanted to check in to see if you have any hesitations before making the switch. We use Squarespace for our own site + shop, which is the main reason why I wanted to start offering templates for this platform. After using Wordpress for years, I was really frustrated with constant updates and 'buggy fixes' that were required. I never felt comfortable making updates on my own, and I'm pretty tech-savvy ;). I only offer products that I truly believe in and find helpful for myself and actually wrote an article on why I love Squarespace so much. Squarespace is REALLY user-friendly. We include video tutorials that cover everything from signing up for the platform to getting each and every button, slideshow, and page set up exactly the way you want them. You can choose to customize your site as little or as much as you want, if you want something totally unique. The sites usually take a few hours to set up from start to finish. We believe launching quickly is essential for staying motivated + on track. People have also asked about how they can organize their blog page, and we're happy to share that Squarespace allows you to organize your content by date, tags, & categories. This website platform utilizes something called a Summary Block, which makes it really easy to create slideshows and other content that pulls from a specific genre. 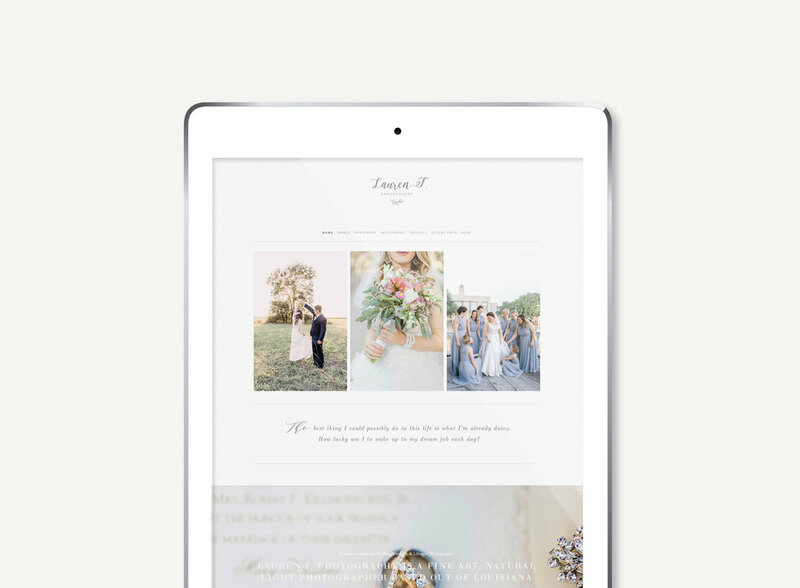 You can see below how Lauren groups the main buttons on her blog into 'Weddings,' 'Lifestyle Sessions,' and 'Seniors.' This is just one example of how you can organize your blog content. All of the buttons can be linked to individual pages, products, blog posts, or external websites as well. Website design doesn't have to be intimidating. We've spent years working out all the kinks so you can get a brand spankin' new site that functions beautifully + is mobile-friendly without having to suffer through all the headaches. Let us know if you have any questions! We'd love to help you launch the website of your dreams!